Each grade item is available in the student’s User Report (unless it’s hidden), and when activities are graded then their values are populated accordingly. Moodle assumes that all grade items are equal and calculates the Course total accordingly, but this can be confusing for students and so it’s helpful to organise the Gradebook to our needs. Summative and formative activities in your Gradebook. Global Online Progress Tests and Final Assessment. 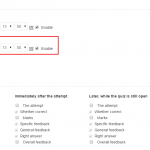 You can create grade items for assessed activities that take place outwith Moodle, eg. a poster presentation or performing a process. 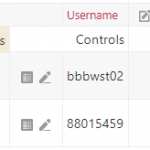 This provides a way of manually entering marks for each student who can then view them in their user report. Manual grade items can be scored as point values, the PG scale or any custom scale you choose to create. Grades can also be imported from a spreadsheet by firstly creating the grade item manually, and then uploading from the spreadsheet of marks in the CSV file format. The formatting of the spreadsheet has to be exact for the import to work and so it’s best to export the gradebook as an Excel file and enter the grades in the appropriate column. Care should be taken to ensure that user and grade Item mapping is done correctly, and if in doubt please contact a Learning Technology Advisor. Once all grading has been completed you can export all the marks and email the spreadsheet to your programme administrator for inputting into SITS. As soon as you have graded an assignment or when students have completed a quiz, the grades are instantly available to them via their user report, or from accessing the activities directly. Therefore you need to think about when you want grades to be available. For Moodle assignments and Turnitin assignments you may wish to release all grades at the same time, and there is also the need to build in time for moderation or to ensure students with late submissions cannot benefit from feedback you have provided to others. The University has a three week window for returning grades and feedback, and the relevant settings are covered in the eSubmission Guidlines. With Quizzes one of the major benefits is the instancy of results but you may want to build in a delay to the release of grades and feedback so that any special arrangements can be met or moderation based on question analysis. 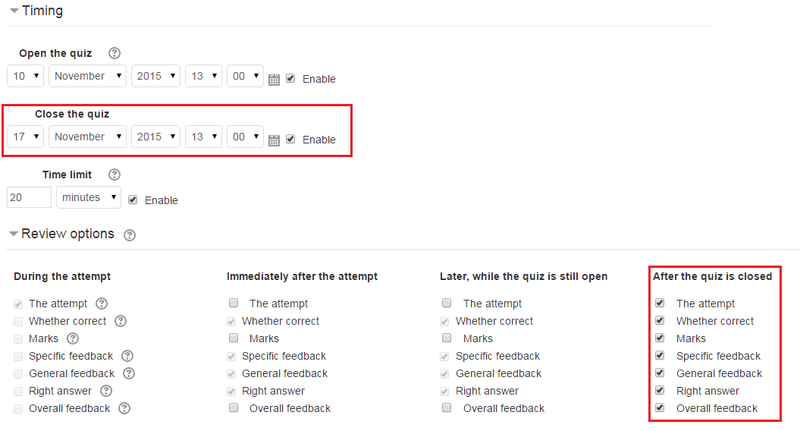 One way to release the grades is based on the Close Date of the quiz and selecting ‘After the quiz is closed’ as the Review Options. This is shown in the example quiz settings where we have made sure that marks and feedback is only available after the quiz is closed.